The Boy Gardener is made in our workshop. The boy is hand painted in blue overalls. 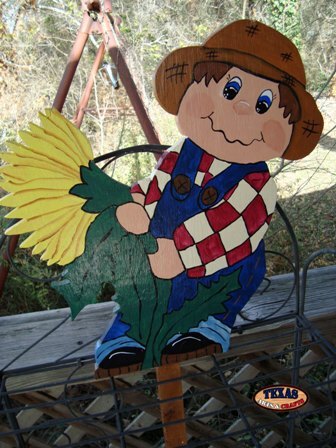 The boy is holding a yellow sunflower. The dimensions for the boy are 18 inches tall by 16 inches wide by 2 inches deep. The sign has a 20 inch peg. The weight with packaging is 3.25 pounds. For the continental U.S. shipping and handling is included in the listed price. For shipping outside the continental U.S. please contact us through our Contact Us page. The Girl Gardener is made in our workshop. 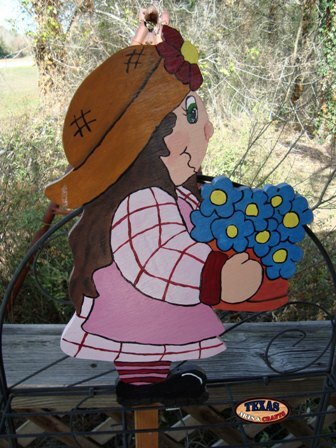 The girl is hand painted in a pink dress with blue flowers. The dimensions for the girl are 18.50 inches tall by 12.50 inches wide by 2 inches deep. The sign has a 13 inch peg. The weight with packaging is 2.50 pounds. For the continental U.S. shipping and handling is included in the listed price. For shipping outside the continental U.S. please contact us through our Contact Us page. 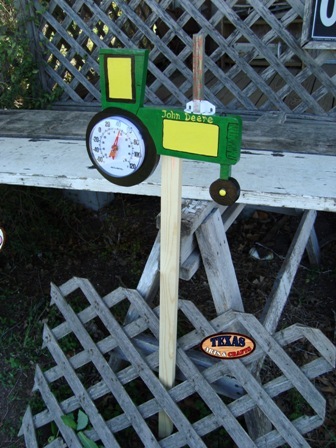 We make the John Deere Tractor Rain Gauge in our workshop. 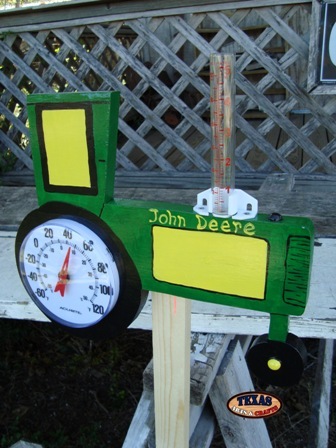 The John Deere Tractor Rain Gauge should be placed in a shaded area to get an accurate temperature reading. The rain gauge includes a thermometer and a rain gauge. The rain gauge is hand painted green. The dimensions are 11.25 inches tall by 13.50 inches wide by 1 inch deep. The sign has a 36 inch peg. The weight with packaging is 3 pounds. For the continental U.S. shipping and handling is included in the listed price. For shipping outside the continental U.S. please contact us through our Contact Us page. 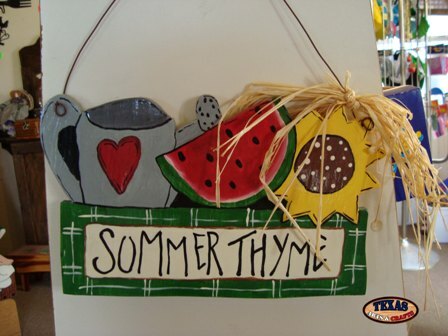 The Sommer Thyme sign is made in our workshop. 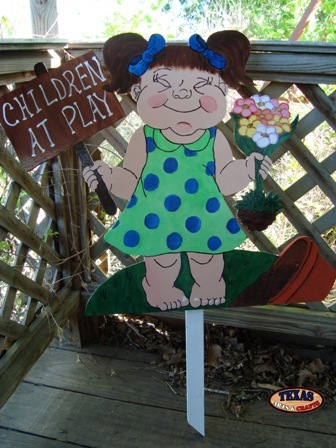 A watermelon, a sunflower, and a pail are hand painted onto the sign. The sign reads Sommer Thyme. The dimensions for the sign are 8 inches tall by 13.25 inches wide by 1 inch deep. The sign has a wire hanger. The weight with packaging is 2 pounds. For the continental U.S. shipping and handling is included in the listed price. For shipping outside the continental U.S. please contact us through our Contact Us page. The Got R Done sign is made in our workshop. 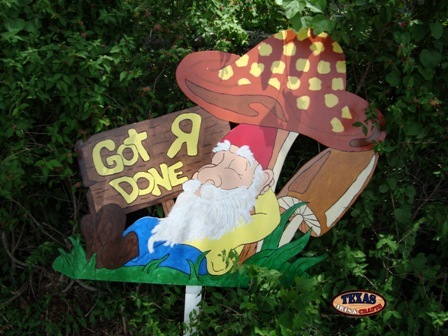 An old man is hand painted yellow and blue laying under a light brown mushroom taking a nap. The sign reads Got R Done. The dimensions for the sign are 37 inches tall by 44 inches wide by 1.50 inch deep. The sign has a 36 inch stake. The sign is a local item only, and should be picked up from our shop or at one of our craft shows. The Children at Play Boy is made in our workshop. 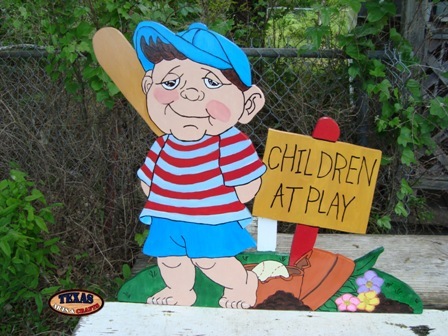 The boy is hand painted in a blue and red striped shirt, blue shorts and blue hat. He is playing baseball. The dimensions for the yard sign are 23 inches tall by 26 inches wide by 2 inches deep. The sign has a 24 inch stake. The weight with packaging is 7 pounds. For the continental U.S. shipping and handling is included in the listed price. For shipping outside the continental U.S. please contact us through our Contact Us page. The Children at Play Girl is made in our workshop. The girl is hand painted in a green dress with blue polka dots. The dimensions for the girl are 23 inches tall by 25 inches wide by 2 inches deep. The sign has a 32 inch stake. The weight with packaging is 8 pounds. For the continental U.S. shipping and handling is included in the listed price. For shipping outside the continental U.S. please contact us through our Contact Us page. The Hanging Parrot item is made in our workshop. 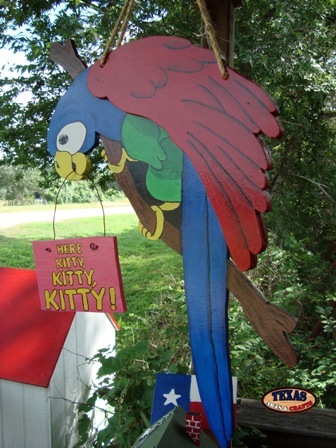 The Parrot is hand painted red,blue, and green. It has a yellow beak and the feet are also yellow. It is holding a sign that says Here kitty, kitty, kitty! The dimensions for the parrot are 27 inches tall by 19 inches wide by 2 inches deep. The rope is 15 inches long. The attached Here Kitty, Kitty, Kitty! sign is 6 inches tall by 8 inches wide by .50 inches deep. The weight with packaging is 8 pounds. For the continental U.S. shipping and handling is included in the listed price. For shipping outside the continental U.S. please contact us through our Contact Us page.